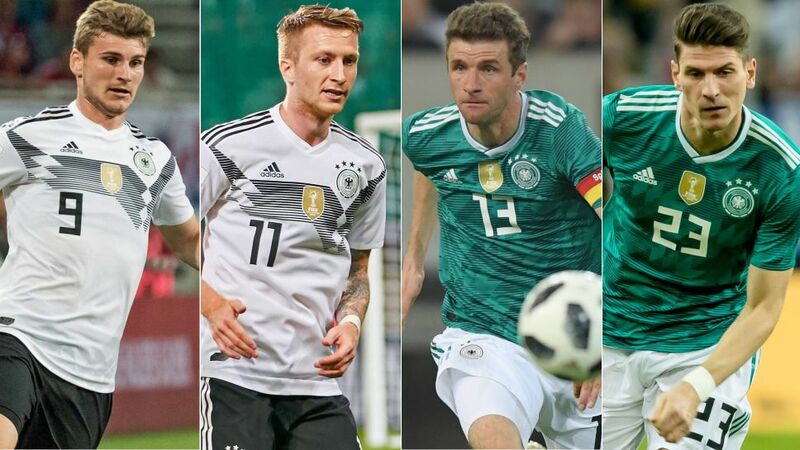 Marco Reus, Thomas Müller, Timo Werner, Mario Gomez. Four men who — on their own — are enough to give even the most battle-hardened defender a spine-tingling chill. So what do you get when you put them together? The answer: Germany's brilliantly complementary and varied attacking options at the 2018 FIFA World Cup. bundesliga.com looks at four reasons why the reigning world champions' opponents in Russia should be afraid. Very very afraid. Watch: Reus, Werner and Müller in pre-World Cup form! Who can forget the Borussia Dortmund man's Germany shirt being brandished by his international team-mates after the ultimate triumph on the pitch in Rio de Janeiro four years ago? The hunger born of missing out in 2014 and at UEFA EURO 2016 is great for Germany, but terrible news for their rivals because a rip-roaring Reus is the last thing they need. "I see him as a player who is incredibly skilful, intelligent and suprises opponents. He shows amazing skill in what he does, it seems to be light and playful. His timing is good, also in his passing, and he's refined in his finishing," said Germany boss Joachim Löw, for whom Reus is "a rocket". In naming the ex-Borussia Mönchengladbach prodigy in his preliminary squad in May, Löw had described Reus as "a special weapon", which makes it easy to see why the 2014 World Cup-winning coach was so keen to make space for a player who made just 11 Bundesliga appearances last season. Reus' stunning statistics in that handful of matches minimise the risk in Löw's logic. Seven goals at a surgical, ruthlessly economical 4.4 shots per strike showed the ability that has brought him a jaw-dropping 63 goals in 136 Bundesliga matches during his Dortmund career is just as acute despite being sidelined for much of the campaign by the serious injury he sustained in the 2016/17 DFB Cup final. Those numbers are all the more impressive as Reus is no out-and-out goal poacher. He is as much a creator as a finisher, which is why Löw also wanted him on the plane to Russia. Watch: A goal against every Bundesliga club for Reus! While his pace is a major asset in a team that — the jet-heeled Werner aside — could be said to be lacking in that department, he provides his boss with the luxury of playing him either through the middle or out wide. That means that Löw can slot Reus seamlessly into the trio behind the central striker in his favoured 4-2-3-1, potentially use him to replace Werner as the side's spearhead, or even play him off Gomez — as Reus did so successfully at Gladbach with Mike Hanke and with Pierre-Emerick Aubameyang at BVB — if the situation requires a tactical tweak. Now that IS a very special weapon. Given the RB Leipzig forward's breakneck pace, his rapid rise to the lofty role of Germany's number one striker should perhaps come as no surprise. "The boy has crazy speed," said Thomas Schneider, one of Löw's assistants and a Werner mentor at Stuttgart. It is that pace that Germany have so long lacked in their central striker, and Werner spectacularly answers that need for speed. Averaging 29 sprints a Bundesliga game for his club last season, the 22-year-old's devastating fleet of foot means the world champions can not only defend from the front, but also tear teams apart on the counter-attack, a key asset notably in the latter stages of the competition when Germany will find their opponents more willing to take the game to them. Not that Werner will be a passenger in the group stage if teams sit deep. His hugely impressive seven goals in his first 13 internationals — allied to his 34 strikes in 63 league matches, including 13 last season, for Leipzig — show he knows how to get on the end of and convert opportunities made for him. You can see him playing on the shoulder of the last defender just outside the penalty area, darting hungrily onto a Mesut Özil flick or Toni Kroos through ball, can't you? You can bet Germany's opponents can too. Watch: Werner's already incredible Bundesliga story! Just what is it that the Bayern Munich man does? He doesn't have the skill of Özil, the strength of Jerome Boateng, the pace of Werner or Reus, and — by his own admission — "I'm not a good dribbler." No-one can really see what Müller does for club nor country. But whatever it is, he does it world-class well. Look at his goal and assists record at international level: 38 goals, 36 assists, 90 matches. Ridiculously good, right? Add to that just seven of those goals have come in friendlies, and ten in only 13 World Cup finals appearances, and Müller is a man you want in your side on the biggest stage of all. While he can finish — he is the leading World Cup scorer of active players, four ahead of club teammate James Rodriguez of Colombia — and can play through the middle, Müller is really the thread that ties the front line together. He is all about prompting and passing as well as — more often than opponents would like him to — popping up in the right place at the right time. His 14 assists in Bayern's title triumph last season — five of which came from the 70 crosses he fizzed into the penalty area — were four more than all the other three forwards in the squad put together, and if Germany are to exploit their staggering attacking potential, Müller holds the key. Edinson Cavani will surely have a lot of sympathy for Gomez as Paris Saint-Germain's Uruguayan marksman is another insanely prolific striker who is often remembered for the few chances he misses rather than the shovelfuls he scores. At nearly 33 years old, Gomez probably no longer worries too much about what the critics think, many of whom would have had Löw opt for Bayern's Sandro Wagner instead. A scoring record of 163 goals in 297 Bundesliga matches and 31 in 74 internationals should reduce the dissenting voices to a whisper, but Löw wanted Gomez for so much more than his scoring record. "When I was 11, 12, I used to have posters of Mario on my wall," Werner has previously admitted, and the reassuring presence of his boyhood hero alongside him at his first major tournament is a canny move from Löw. But Gomez will be much more than a cheerleader and confidante for his young team-mate. Though likely to only play a bit-part role on the pitch, he will provide Löw with an alternative in the central role. He covered on average fewer than 10 kilometres per league game last season — Müller and Werner were over 11 — but that relative lack of movement means he remains centrally placed, a solid pivot around which Germany's obscene wealth of goalscoring attacking midfielders can buzz while he holds the ball up. And with a top speed of 33.6km/h last season — faster than Reus — his imposing frame can still shift. Surprised? Bet you were. Watch: Mario Gomez's Top 3 Bundesliga goals! The former Bayern, Fiorentina and Besiktas man's aerial ability — he won 48 per cent of his aerial duels last term — means he can get on the end of crosses as well as win balls played up to him; his 37 fouls last season — nearly double that of Müller — also more than hint at a physicality that will help take the strain if the going gets tough for his more silkily skilled team-mates. He will be a hulking, not sulking presence for the squad in a team sport where egos can undermine title tilts, lifting spirits in the dressing room even if he isn't performing much on the pitch. "I'll watch the squad announcement calmly and hope that I'm in," Gomez had said before Löw made his preliminary selection public. "And if I'm not, I'm not." But he is, and Germany are all the better for it. Click here for all you need to know about Germany at the World Cup!